If you have ever had a critical publisher file damaged, you would receive an error from Publisher stating it cannot open the file. If the file was a really important file, then the data contained within it would have been lost forever. 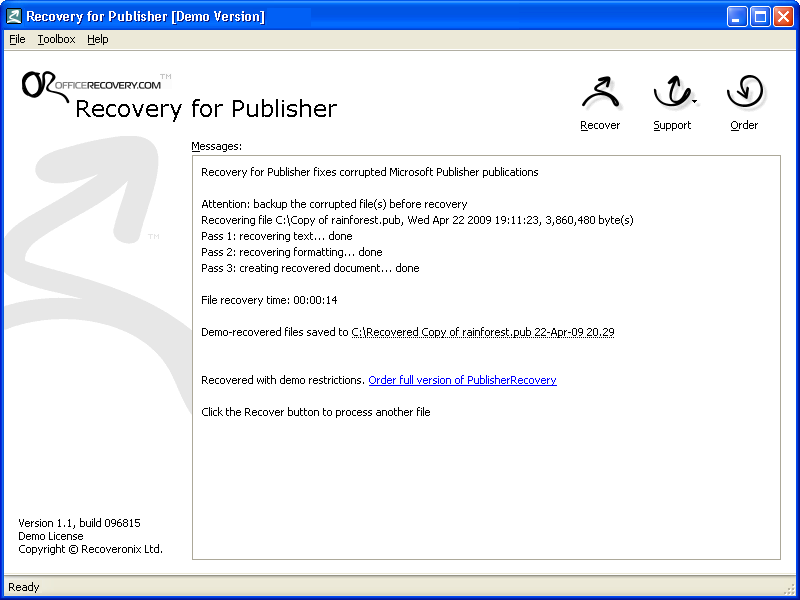 But there is a small utility called Recovery for Publisher that will allow you to recover your damaged publisher files. Download Recovery for Publisher from the official website or a mirror. Start the application and select Recover from the menu. Select a file from your hard drive to recover. Recovery for Publisher will automatically recover your file. Some limitations of this software are that it does not recover all Office WordArt objects in the file and also it is not free and open source and costs over $100 to purchase. An open source equalivent of this program has not yet been found. If you found this article helpful or useful, please help Compdigitec spread the word. Don’t forget to subscribe to Compdigitec Labs for more useful or interesting articles! If you found this article helpful or interesting, please help Compdigitec spread the word. Don’t forget to subscribe to Compdigitec Labs for more useful and interesting articles! Compdigitec Labs is powered by the WordPress publishing platform. © Copyright 2014 Compdigitec. All rights reserved. Content on Compdigitec Labs may not be copied unless in compliance with Compdigitec Labs's copyright and licensing policies.